Deb Gangwish inspects soil on her farm near Shelton, Neb. For Del Ficke, improving the soil is a spiritual quest. The carbon, or "organic matter" content of this soil on Del Ficke's farm has more than doubled since he changed his farming practices. Bryce Irlbeck of Manning, Iowa, says his family's farm uses less fertilizer now that they are planting cover crops between harvests. 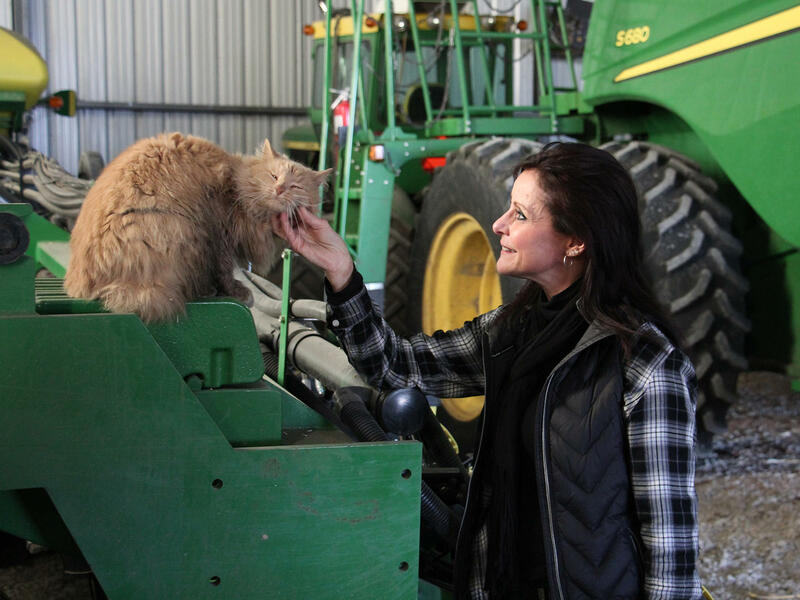 Deb Gangwish with Farley, a cat that once stowed away in a truckload of hay and made it all the way from Nebraska to Illinois and back. "You can pick it up and it smells like dirt," Bryce Irlbeck told me, as we stood in a field near Manning, Iowa. "You can go on a lot of arms in Iowa and the dirt doesn't smell like dirt anymore." And in Pleasant Dale, Neb., Del Ficke was practically ecstatic. "Look at this! And the smell! It smells beautiful! It's alive!" For years, talk of "healthy soil" was mostly limited to organic farmers and others on the fringes of mainstream American agriculture. No more. Articles about soil health fill major farm publications. It's the subject of several recent books. Big food companies are on board, and some of them are discussing a new eco-label for food, alongside "organic" and "fair trade," that would reward farmers for adopting practices the build healthy soil — what many are calling "regenerative agriculture." It's also provoked lots of debate. Some farmers have made claims of dramatic success that others have called unrealistic. There's no universally accepted measure of soil health, nor a clear definition of regenerative farming. Each of the farmers I met approaches it differently. For Ficke, it's a spiritual quest. He recalls the moment, on a Sunday morning, when he heard a call from God to farm in a different way, one that felt closer to the native prairie that used to flourish in eastern Nebraska. "I could feel it in my heart that we had to change. We are running out of time," he says. The call to change involved a lot of things, but near the top of the list was protecting the soil. Farmers around the world have been mining that soil for centuries. "It should be on the list of endangered species. Soil is endangered!" Ficke says. For Ficke, protecting it means, first of all, no more tilling the ground, breaking it up with plows and discs. "Tillage is the most destructive thing in agriculture," he says. That's not even controversial anymore. Many farmers have adopted "no-till" farming, recognizing its environmental benefits. But Ficke goes way beyond that. After he harvests his corn or soybeans, he plants something else on those fields right away — often a mixture of grasses and legumes like cowpeas. On some of that land, he keeps those "cover crops" growing right on through the next summer, instead of conventional crops like corn. His cattle graze on those fields the way bison once grazed on the prairie. The roots of these cover crops, decaying in undisturbed soil, enrich the soil. So do manure and urine from his grazing cattle. With time, the soil grows darker, more fertile — chock-full of microbes and fungi. None of this is a new discovery, exactly. But two things have changed. Change #1: Ficke now has plenty of company. "When I started doing this stuff — really doing this stuff — five years ago, you had to go a state away to find people" farming in a similar way, Ficke says. Perhaps the most famous soil health pioneer is a farmer named Gabe Brown, in North Dakota. "Those people are all over now," Ficke says. "You can find someone like that every few miles." There's Bryce Irlbeck, for instance. He's simply looking for the practical advantages that healthier soil can bring. "When we put that carbon back in the soil, we can see the effects of reduced fertilizer [use], reduced erosion," he says. Soil that's full of decaying roots and microbes is like a sponge; it soaks up water and is better able to handle floods and droughts. It's also full of plant nutrients, so Irlbeck won't have to spend as much money on fertilizer. "I think there is a movement, and I believe that farmers want to be part of that movement," he says. "It's just figuring out how to do it and stay economically viable." That's the catch. Planting those additional soil-building cover crops costs money up-front, Irlbeck says, and it takes years to see the benefits. This is the main reason why only 5 or 10 percent of farmers in Iowa are really doing it. In fact, until recently, a lot of his neighbors thought he was a little crazy. Now, they're asking him lots of curious questions. That's probably because of big change #2. Farmers are now hearing about the virtues of healthy soil from some of the biggest, most powerful names in American agriculture. These include Monsanto, the seed and chemical company; food giants like General Mills and Walmart; also environmental organizations like the Union of Concerned Scientists and the Nature Conservancy. They're all talking about healthy soil as a way the farmers can help the environment. It's driven in part by concern over global warming. Tilling and draining soil have released enormous amounts of carbon dioxide over the years. Regenerative farming puts some of that carbon back in the ground, slowing global warming. 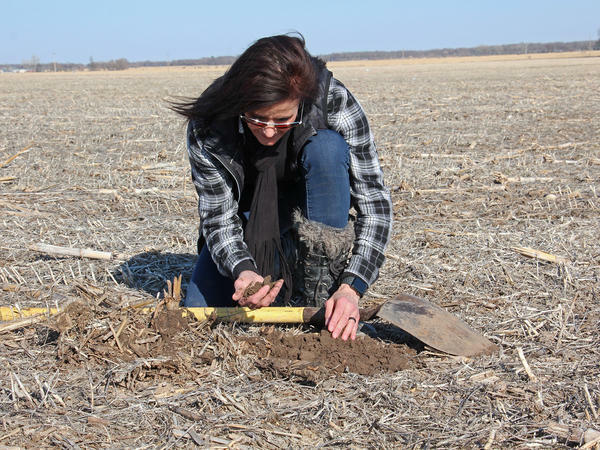 A coalition of food companies and environmental organizations has set up a new organization, the Soil Health Partnership, which in turn has signed up a hundred participating farmers — including Deb Gangwish, co-owner of PG Farms in Shelton, Nebraska. "We want to always strive to be better, and I want consumers, or folks who are removed from agriculture, to understand what we are doing, and how much we care, and [that] we're always striving to be more sustainable," Gangwish says. This business-backed soil health organization, however, is promoting changes that are pretty modest. You could call it soil health lite. It's carrying out experiments on these participating farms to measure the impact of farming without tillage, or growing cover crops in between regular plantings of corn and soybeans. The goal is to learn how those practices affect a farmer's profitability along with specific measures of soil health. Del Ficke, the soil health pioneer, has mixed emotions about this partnership. He's in favor of anything that persuades more farmers to reduce tillage or plant cover crops, but he doesn't entirely trust the companies' new-found enthusiasm for soil health. "Are they feeling it their heart? Is it a marketing deal? What is it?" he says. There may, in fact, be a marketing angle to soil health. Some food companies have been talking about a new label for food that's grown using methods that improve the soil. On the supermarket shelf, it might take its place beside packages labeled as organic, non-GMO, or Fair Trade. This one might be called "regenerative." Proponents of such a label say it could encourage farmers to join the movement, paying them to help the soil. But Matthew Dillon, director of agriculture for Clif Bar & Company, doesn't think it's a good idea, at least not yet. There's a lot of uncertainty about what farming practices really are best for the soil in different regions, he says, so it's too soon to start using such labels. In an interview with the news site Food Navigator, Dillon said that the labels "may be "good for marketers, but they may not necessarily be good for consumers or for farmers if we're not all clear what the terms mean," he says. In American farm country, there's a grass-roots movement taking hold - a movement for healthier soil that's chock-full of plant, roots, microbes and earthworms. It might even lead to a new label on the food you see in your grocery store, alongside labels like organic and fair trade. NPR's Dan Charles has our report. 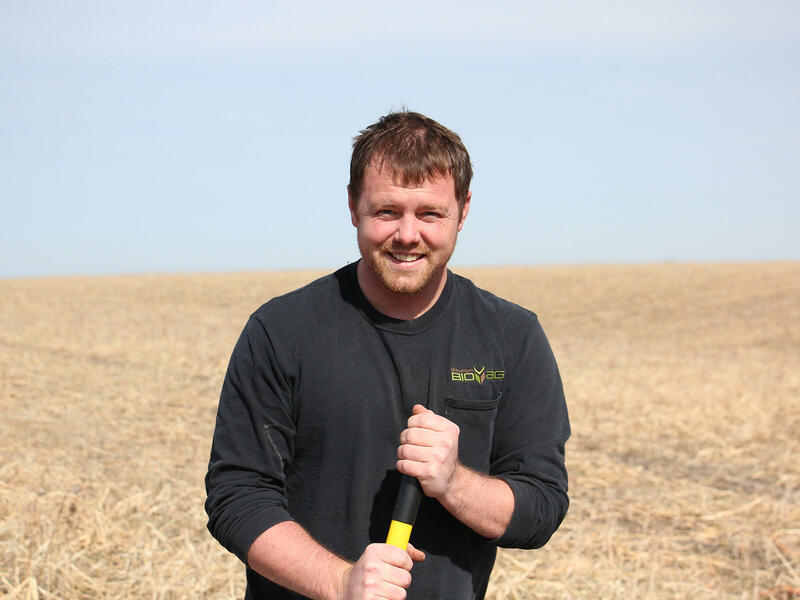 DAN CHARLES, BYLINE: On three different fields in Iowa and Nebraska recently, three different farmers dug up some dirt and held it like hidden treasure. DEB GANGWISH: You can see how beautiful. It's healthy - that soil - I mean, it's just - I'm not a soil scientist, but I love soil. BRYCE IRLBECK: You can pick it up, and it smells like dirt. And you can go on a lot of farms in Iowa, and the dirt doesn't smell like dirt anymore. DEL FICKE: Look at this - and the smell. It smells beautiful. It's alive. CHARLES: These three farmers - Deb Gangwish, Bryce Irlbeck, Del Ficke - are all part of a soil health movement. Some people call it regenerative farming - regenerating the soil. But it means different things to each of them. For Del Ficke - the last voice you heard calling his soil alive - it's a kind of spiritual mission. FICKE: Right over - kind of catty-corner from that tree, up over that ridge, is the spot where I got my calling. CHARLES: He felt called to protect the soil. FICKE: It should be on the list of endangered species. Soil is endangered. CHARLES: And protecting it means, first of all, no more tilling the ground - breaking it up with plows and discs. FICKE: Tillage is the most destructive thing in agriculture. CHARLES: No-till farming is actually pretty common these days. But Ficke goes way beyond that. After he harvests his corn or soybeans, he plants something else on those fields right away, like grasses and peas, to keep roots growing in the soil. And then on some of that land, he keeps these so-called cover crops growing right on through the next summer instead of regular crops like corn. His cattle graze on the grass the way the bison used to. The roots return carbon to the soil - make it darker, more fertile, full of microbes and fungi. Much of this is actually just old-style farming from decades ago. But two things about it are new. First of all, more and more farmers are doing it. FICKE: When I started doing this stuff - really doing this stuff five years ago, you had to go a state away to find people. Those people are all over now. You can find somebody like that every few miles. CHARLES: All over the Midwest - in Manning, Iowa, for instance, there's Bryce Irlbeck. IRLBECK: We can see - when we put that green carbon back in the soil, we can see the effects of reduced fertilizer and reduced erosion. CHARLES: He is trying to rebuild a soil for simple, practical reasons because healthy soil is a sponge for water. It will come through droughts and floods much better. It's also more fertile, so you won't need to spend as much money on fertilizer. IRLBECK: I think there's a movement. And I believe the farmers want to be a part of that movement. It's just figuring out how to do it and economically stay viable. CHARLES: That's the catch because planting these extra soil-building crops costs money upfront, he says. And it takes years to see the benefits. So only 5 or 10 percent of farmers in Iowa are really doing it. But here's the second thing that's new. Some of the biggest names in American agriculture have taken up the soil health cause - like Monsanto, the seed and chemical company, food giants, like General Mills and Walmart, also national environmental organizations. They're all talking about healthy soil as a way that farmers can help the environment. Putting carbon back in the soil can slow down global warming, for instance. And they're all backing a new organization - a soil health partnership that signed up 100 participating farmers, including Deb Gangwish, that farmer you heard digging up some soil on her farm in Nebraska. GANGWISH: We want to always strive to be better. And I want consumers - or folks who are removed from agriculture - to understand what we are doing and how much we care. CHARLES: This business-backed soil health partnership is what you might call soil health-lite. It's looking at modest steps, like no-till farming or growing a cover crop over winter in between the regular plantings of corn and soybeans. Del Ficke, the soil health prophet, has mixed emotions about it. FICKE: Are they feeling it in their heart? Is it a marketing deal? What is it? CHARLES: There may be a marketing angle, in fact. Some food companies have been talking about a new label that could go on food from farms that rebuilds soil the way Ficke does. It would be yet another label up there beside organic, non-gmo, fair trade. This one might be certified regenerative. Dan Charles, NPR News. (SOUNDBITE OF BADBADNOTGOOD AND GHOSTFACE KILLAH'S "FOOD") Transcript provided by NPR, Copyright NPR.